Nollywood news + Naija Gist | Yoruba movies, Naijagist, Nigerian music, Naija news, Nigerian movies: Late Ojukwu Wife old photos 30-yrs ago when she won Most beautiful girl in Nigeria. 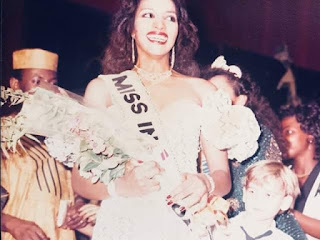 "30 YEARS AGO TODAY: BIANCA ONOH WINS ‘ MOST BEAUTIFUL GIRL IN NIGERIA PAGEANT’. 4 DEC. 1988. This was an awesome experience which provided a wonderful opportunity to visit over 20 countries of the world in the space of one year of my ‘reign’(a great privilege for a mere student) including 12 European countries as well as several other world destinations including Singapore, Japan, Russia, Taipei, Dubai, Republic Of China, Hong Kong where I represented Nigeria at the MISS WORLD beauty Pageant and Cancun, Mexico where I was the Country’s representative at the MISS UNIVERSE Pageant. It is to God’s glory that I went this far. Today, as always, I continue to celebrate the amazing opportunities God has thrown along my path in life. This is just one of them."